The rules of "The Greatest Tournament in Chess History," the USD 20 million Sheldrake Memorial Tournament, a.k.a. 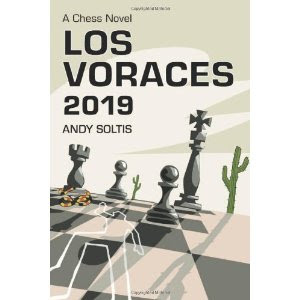 Los Voraces 2019, are: no seconds, no agents, no computers, no entourages, no pagers, no power palms, no phone calls - no outside contact of any kind - as the fourteen greatest chess players in the world gather to compete for money and fame. Anybody read this? I was wondering if it might make a reasonable Christmas present to myself. I believe that this is based on the series that Soltis did for the old (and excellent) Chess Cafe website, before it succumbed to the need to become a commercial web-enterprise. I read it back then (2000? 2001?) but IMHO it was dull and predictable. The sort of chess-based thriller you or I might write. But of course these things are a matter of taste - and in fact it is probably no worse than a number of mainstream novels that I've struggled to get through in 2015. Jon h is right. Awful stuff. On the plus side, the book should sell very well, given that there are 605 million people worldwide in its potential audience.